StressCheck Core | ESRD | Engineering Software Research and Development, Inc.
StressCheck® Core is the primary building block of StressCheck® Professional. It includes the 64-bit graphic user interface (GUI) and features a complete pre- and post-processor built around a parametric handbook framework that supports standardization of design and analysis processes. Any attribute of the model (geometry, material properties, loads, constraints) can be defined parametrically, and in many cases formulae may be used as input or output. All the tools needed to perform model verification and validation. StressCheck® Core also includes support for Parasolid CAD importation, an integrated MeshSim automesher for curved 2D and 3D automatic meshing, and a COM API for development of custom applications or communication with other analysis tools (e.g. Excel, MATLAB, MathCAD, AFGROW, etc.). StressCheck® Core integrates the MeshSim automesher from Simmetrix, allowing users to jump right into meshing their complex geometries with curved elements. The automesher supports 2D and 3D meshing of sheet and solid bodies, imported or generated by StressCheck® Core’s geometry modeling engine. StressCheck® Core contains powerful Parasolid kernel functionality for fully-parametric CAD modeling, either from “scratch” or by modification of imported geometry. 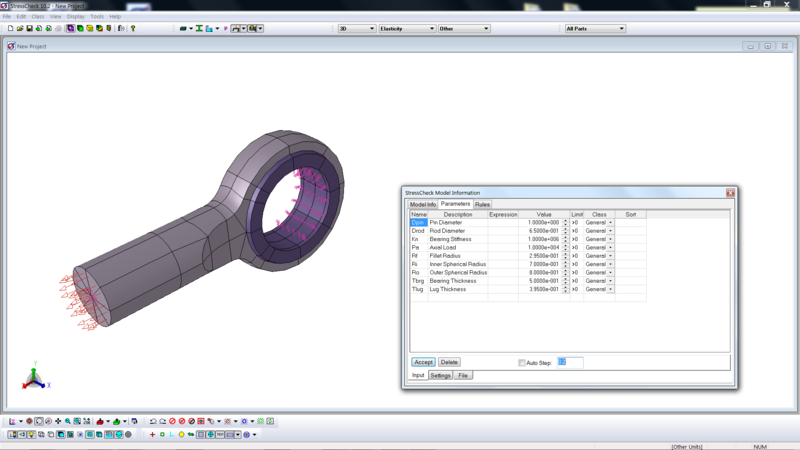 This includes operations such as blends, Booleans, chamfers, embedding of surfaces, imprints and more. The Design Study feature of StressCheck® Core is the most efficient way to computationally determine the influence of independent design variables on the data of interest. Independent variables can include geometric sizings, material properties, loads, constraints and more. Included in StressCheck® Core is the functionality to set up multi-body contact analyses quickly and easily. Simply declare the contact regions for each part to be analyzed, connect the regions via contact constraints, and solve elastic or elastic-plastic materials. No gimmicks, no special elements required. There can be one contact pair or many, as there is no limit to the number of parts in the analysis. StressCheck® Core supports shell-solid connections for improved efficiency in the analysis of laminated composites. Include thin structural features (skins, webs, etc.) without compromising the quality of the solution in the region of primary interest. Need to model thin and thick solids at the same time? The concept behind the thin solid formulation is to reduce the degrees of freedom (DOF) where they are not needed, and to keep them where they are. Thin parts need fewer DOF through the thickness because stress distributions are expected to be simpler. With StressCheck®‘s hierarchic modeling, skins, webs and lamina problems become easy to handle. Support for breakout, or Global-Local, analysis in StressCheck® Core is a life-saver for companies needing to transfer structural loads to detailed models quickly and accurately, and obtain reliable solutions for detailed stress, fracture or composites analyses. Import point forces/moments a variety of ways, and use Global-Local features to apply to detailed parts. Develop custom applications tailored for your organization through the StressCheck® API. From simple Excel VBA scripts to .NET programs with WPF front ends, StressCheck® Core’s Application Development toolkit supports solutions for the most creative engineers. Design customized “Smart Apps” similar to StressCheck® Tool Box’s SFAT, MFAT and LCAT. Plug-in with other tools such as AFGROW and MATLAB.